In ballroom dancing, there are two major styles in Ballroom Dancing today. Each has their own style and style of standard smooth dresses that the dancers wear. While both types have their differences, there are many similarities between the two styles. These differences are what determine the style that you prefer to dance, and the style of standard smooth ballroom gowns that you wear. North America social dancing, and has become the recognized style of competitive dance. It became popular with dancers since there was not strict foot placement and rigid feeling to the dances. North American dancers wanted to have fun while dancing. American Ballroom dancing has two styles of dance in the “Smooth” style. The American “Smooth” style allows for both open and closed positions in the dance and is very much the “Fred and Ginger” dance style. https://www.dancevision.com/buyers-guide/resources/dances_defined/44/ is danced in a closed position, and dancers must maintain contact during the dance. The American “Smooth” Style has a large variety of moves in its dance patterns and is easy to learn for both beginner and intermediate dancers. For competition and advanced levels, the American Styles are just as hard to master as the International dance styles. During competition most advanced levels dancers wear custom made Standard Smooth Competition Dresses that are high quality. The reason for this is that the fit of the custom made Standard Smooth Competition Dresses is much better than off the rack dresses. The fit is very important since if a dress is too tight, you will not be able to dance comfortably. Dresses that are too loose do not look as good and can make dancer feel unsure of their dance steps. The right style of standard smooth dresses is also important since there are differences in the styling of dress for both American Smooth and International Standard. The first major difference in standard smooth ballroom gowns is floats. Floats are small pieces of fabric, beading, or feathers attached to the sleeves. These are commonly seen in International Standard dresses to add interest to the upper body. They are rarely seen in American Smooth, as they can become tangled during the dance. Custom made Standard Smooth Competition Dresses can be made with or without floats to meet your needs. The other notable difference in standard smooth ballroom gowns is the shape, size, and details of the skirt. American smooth dress skirts are slimmer and may have slits in the skirt to help with the dancer’s movement. International Standard skirts are normally fuller and have many layers to help create the illusion of more movement. You should be confident in your dress no matter what style you dance. 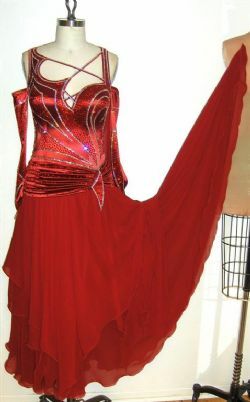 Having a high-quality custom made Standard Smooth Competitions dress will make you feel amazing while you are dancing. Standard Smooth Dresses for Competition, Ballroom Dance Dresses, American Smooth gowns & International Standard Dance Dresses Custom Designed & Made by Zhanna Kens. Call Now for Free Consultation with the Designer 1(844)769-2595!